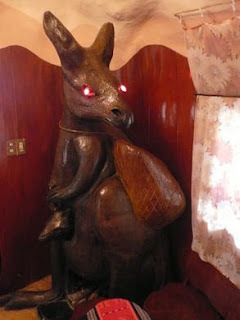 Imagine staying in a room where you are watched over by the glowing red eyes of a kangaroo. 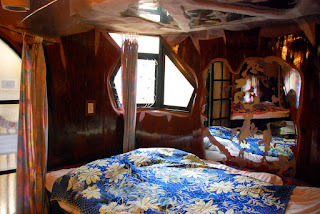 Or take in the features of elaborate local tribal decorations, or carved birds looming over your bed as you are tucked snugly into cave-like nooks. Guests can experience this surreal amazing resort that’s popular with honeymooners, where this guesthouse, bizarre in its design, is one of the true landmarks sited in the city of Da Lat in Vietnam. 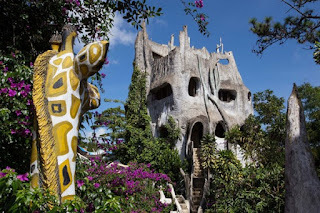 In the Crazy House, Antoni Gaudi meets Alice in Wonderland in a fantastic folly of twisting, tree-trunk-like concrete and artificial caverns, winding flights of stairs and irregular windows, stalactites and stalagmites, flowering purple vines, and an over-sized sculpture of a giraffe. Gaudi is famous in Barcelona, and this - the Crazy - is definitely worth the visit when in Vietnam. The whole complex was a labor of love for avant-garde architect Hang Nga, who lives on site and sometimes chats with guests. She is an interesting person to talk to. Besides designing buildings like this and her other Da Lat landmark ("The House of One Thousand Roofs," now demolished), she is daughter of a former Vietnamese vice president. Sightseers are welcome to tour the building during the day for a small fee or to book a room and stay the night. Bring warm clothes - the Da Lat Crazy House is at a high altitude, and all that concrete gets mighty chilly after sunset. Da Lat Crazy Horse is just a 10-minute taxi ride from the center of town. It is important that visitors watch their step and keep an eye on any children. There are several stair cases and rooms which have, although unique, less than adequate safety railings. In many places visitors are facing a 50+ foot drop.